In professional diving, communication is usually between a single working diver and the diving supervisor at the surface control point. This is considered important both for managing the diving work, and as a safety measure for monitoring the condition of the diver. The traditional method of communication was by line signals, but this has been superseded by voice communication, and line signals are now used in emergencies when voice communications have failed. Surface supplied divers often carry a closed circuit video camera on the helmet which allows the surface team to see what the diver is doing and to be involved in inspection tasks. This can also be used to transmit hand signals to the surface if voice communications fails. Underwater slates may be used to write text messages which can be shown to other divers, and there are some dive computers which allow a limited number of pre-programmed text messages to be sent through water to other divers or surface personnel with compatible equipment. Recreational divers do not usually have access to voice communication equipment, and it does not generally work with a standard scuba demand valve, so they use other signals. Hand signals are generally used when visibility allows, and there are a range of commonly used signals, with some variations. These signals are often also used by professional divers to communicate with other divers. There are also a range of other special purpose non-verbal signals, mostly used for safety and emergency communications. A hard-wired diver communications unit mounted in a waterproof box for convenience of transport and protection. The loose speaker has been added to increase output volume. there is a built in speaker behind the perforations on the panel. Inside a Kirby Morgan 37 helmet showing the microphone in the oro-nasal mask, and one of the speakers at the top of the photo. Divers breathing helium may need a decoder system also called unscrambling, which reduces the frequency of the sound to make it more intelligible. The surface caller should also give the diver a chance to temporarily suspend or slow down breathing, or stop using noisy equipment, as breathing noise is often so loud that the message can not be heard over it. 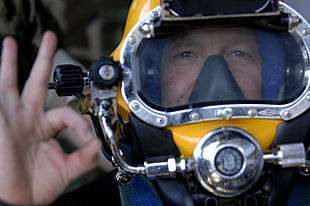 Closed circuit video is often fitted to the helmets of surface supplied commercial divers to provide information to the surface team of the progress of work done by the diver. This may allow the surface personnel to direct the diver more effectively to facilitate the completion of the task. This is always used with voice communication. The communications cables for these systems are part of the divers umbilical. Video may also be used to monitor the occupants of a closed diving bell. Hand signals are a form of sign system used by divers to communicate when underwater. Hand signals are useful whenever divers can see each other, and some can also be used in poor visibility if in close proximity, when the recipient can feel the shape of the signaller's hand and thereby identify the signal being given. At night the signal can be illuminated by the diver's light. 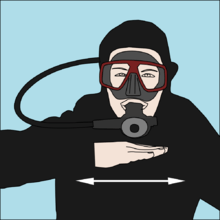 Hand signals are the primary method of underwater communication for recreational scuba divers, and are also in general use by professional divers, usually as a secondary method. 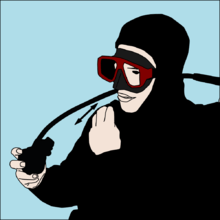 Divers who are familiar with a sign language such as American sign language and equivalents may find it useful underwater, but there are limitations due to the difficulty of performing some of the gestures intelligibly underwater with gloved hands and often while trying to hold something. Member agencies of the Recreational Scuba Training Council (RSTC) in the United States have recognised a standardised set of hand signals intended for universal use, which are taught to diving students early in their entry level diving courses. The OK sign may be also be made without extending the fingers if wearing gloves. Danger in that direction: Clenched fist pushed/pointed in the direction of the perceived hazard. Decompression or Safety stop: Signal is used to indicate that the diver intends to do a safety stop at that point. I am on reserve or I am on bailout gas or I am low on gas: Clenched fist held steady, about level with head or chest, palm side usually forward. Also may mean hold or stay there. Turn or terminate the dive. The thumb points upwards to indicate ascent, and the forefinger points towards the exit from a penetration dive. This signal may also mean that is the way out. 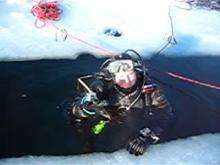 These are generally used in conditions of low visibility where a diver is connected to another person, either another diver or a tender on the surface, by a rope. These date back to the time of the use of Standard diving dress. Some of these signals, or pre-arranged variants, can be used with a surface marker buoy. 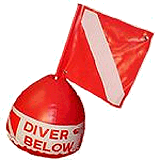 The diver pulls down on the buoy line to make the buoy bob in an equivalent pattern to the rope signal. Effective rope signals need a free line without much slack, Before attempting a rope signal, the slack must be taken up, and the line pulled firmly. Most signals are acknowledged by returning the same signal, which shows that it was received accurately. Persistent failure to acknowledge may indicate a serious problem and should be resolved as a matter of urgency. There are several systems in use, and it is necessary to have agreement between diver and tender before the dive. BS-AC have a very small set of rope signals. Most of them have the same meaning as the equivalent commercial or RN signal. One pull on the line: OK? Signals are combinations of pulls and bells, A pull is a relatively long steady tension on the line. Bells are always given in pairs, or pairs followed by the remaining odd bell. They are short tugs, and a pair is separated by a short interval, with a longer interval to the next pair or the single bell. The technique and nomenclature derive from the customary sounding of the ships bell every half-hour during the watches, which is also performed in pairs, with the odd bell last. One bell is not used as a diving signal as it is difficult to distinguish it from a jerk caused by temporarily snagging the line. All signals start with a pull to attract attention, and this must be acknowledged before the actual signal is made. RN signal include short, paired "bells" and longer "pulls". The RN signals are almost identical to the rope signals used by commercial divers in the UK and South Africa. The US Navy also has a standard set of line signals. These include general signals from diver to tender, search signals and emergency signals. The signal to change from general to search signals or vice versa is seven pulls, and the meaning of the signals may vary depending on whether it is given by the diver or the tender. Most signals are acknowledged by returning the same signal, confirming that the signal was received correctly. Written messages on plastic slates can be used to convey complex messages with a low risk of misunderstanding. Slates are available in various sizes and are usually hard white plastic with a matte finish, suitable for writing on with a pencil. They can be stored in various ways, but in a pocket or bungeed to the wrist are popular methods. Clipped to the diver by a lanyard is another method, but there is a greater risk of entanglement. Slates may be used to record information to be used on the dive, such as decompression schedules, to discuss matters of importance for which hand signals are not sufficient, and to record data collected during the dive. Waterproof paper wet-notes are a compact equivalent, and pre-printed waterproof data-sheets and clip-board are routinely used by scientific divers for recording observations. Cave arrows, Line arrows or Dorff markers (after Lewis Holtzendorff) are plastic arrowhead markers which are hooked onto a cave line by wrapping the line around the arrow through the slots. They are used to indicate the direction to the exit, and can be identified by feel. The message is simple, but of critical importance, as if a diver does not know which way to go at a line junction there is a risk of serious trouble. 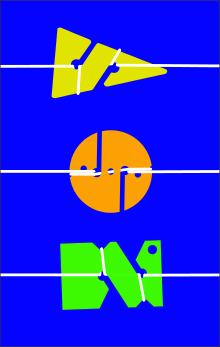 Line arrows are also used at a junction on the permanent line, and at a tie-off, so when the diver gets back to the tie-off, he or she can identify which way to turn. 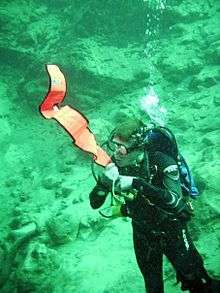 Non-directional and hybrid personal line markers are used to indicate the identity of a diver who has passed along the line and has not yet returned to that point. They are attached to the line in the same way as cave arrows, and are deployed on the way into the cave, usually at critical points such as forks or jumps, and are used to indicate to other divers that someone is further in along the line. They are marked to identify the diver, and are recovered by the diver on the way out. Cookies (round markers), Rectangular referencing exit markers and clothes pegs are used for this purpose. The round and rectangular markers are attached to the line in the same way as arrows, and may be personalised in any way that the owners can easily recognise. Colour is often used, but as there are a limited number of standard colours available, and they are often poorly distinguishable in the dark, modifications to shape may be used which can be recognised by touch. Arrows should always be placed on the outbound side of an intersection as this is unambiguous. Sometimes there is more than one exit from an intersection. Both should be marked with arrows, but the preferred exit can be marked with two arrows in series. The arrows always point in the direction along the line towards an exit. A list of tap codes may be fixed to the interior and exterior of a closed bell to ensure mutually understandable communication. 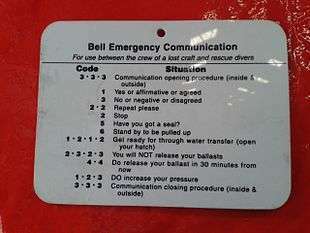 Tap codes, made by knocking on the hull, are used to communicate with divers trapped in a sealed bell or the occupants of a submersible or submarine during a rescue. The Buddy-Watcher is a wrist mounted buddy alert device which sends an ultrasonic signal when a key is pressed, for at least 20m through the water to the matching unit on the dive buddy, which will produce a silent vibratory and visual signal alerting the diver that their buddy wants attention. There is no direct indication to the sender whether the signal has been received and no indication of distance or direction to the buddy. The device is waterproof to 40m, therefore is suited for recreational scuba diving use, but not technical diving. The original communication between diver and attendant was by pulls on the diver's lifeline. Later a speaking tube system was tried, but it was not very successful. A small number were made by Seibe-Gorman, but the telephone system was introduced soon after this and since it worked better and was safer, the speaking tube was soon obsolete, and most helmets which had them were returned to the factory and converted. In the early 20th century electrical telephone systems were developed which improved the quality of voice communication. These used wires incorporated into the lifeline or air line, and used either headsets worn inside the helmet or speakers mounted inside the helmet. The microphone could be mounted in the front of the helmet or a contact throat-microphone could be used. At first it was only possible for the diver to talk to the surface telephonist, but later double telephone systems were introduced which allowed two-divers to speak directly to each other, while being monitored by the attendant. Diver telephones were manufactured by Siebe-Gorman, Heinke, Rene Piel, Morse, Eriksson, Draeger and others. This system was well-established by the mid-20th century, and has been technologically improved, but is still in common use for surface-supplied divers using lightweight demand helmets and full-face masks. More recently, through-water systems have been developed which do not use wires to transmit the signal. Manufacturers include Ocean Reef and Draeger. These allow communications over limited distances between divers and with the surface, using a push to talk system. 1 2 3 4 5 6 7 8 9 10 11 12 13 14 15 16 17 18 19 20 21 22 23 24 25 26 "Minimum Course Content for Common Hand Signals for Scuba Diving" (PDF). Recreational Scuba Training Council, Inc. (RSTC) (Jacksonville, FL., USA). 1 December 2005. Retrieved 3 July 2016. 1 2 3 4 5 6 7 Bevan, John, ed. (2005). "Section 6.2 Diver voice communications". The Professional Divers's Handbook (second ed.). 5 Nepean Close, Alverstoke, GOSPORT, Hampshire PO12 2BH: Submex Ltd. ISBN 978-0950824260. 1 2 3 4 Staff (February 2014). "IMCA International Code of Practice for Offshore Diving" (PDF). IMCA D 014 Rev. 2. International Marine Contractor's Association. Retrieved 22 July 2016. 1 2 3 4 5 6 7 Hanekom, Paul; Truter, Pieter (2007). "Section 3: Scuba diving". Diver Training Handbook (3rd ed.). Cape Town: Research Diving Unit, University of Cape Town. 1 2 3 US Navy (2006). US Navy Diving Manual, 6th revision. United States: US Naval Sea Systems Command. Retrieved 2016-09-05. ↑ Bevan, John, ed. (2005). "Section 6.3 Diver hand signals". The Professional Divers's Handbook (second ed.). 5 Nepean Close, Alverstoke, GOSPORT, Hampshire PO12 2BH: Submex Ltd. ISBN 978-0950824260. ↑ Salter, Marilyn Burke (1982). "Use of American Sign Language for Underwater Communication". Thesis (Ph.D.). Urbana-Champaign: University of Illinois. Retrieved 13 September 2016. 1 2 "Dive Links". Retrieved 2009-04-14. 1 2 3 4 5 6 "Underwater Signals - UKDivers.net". Retrieved 2009-04-14. 1 2 3 4 5 6 7 8 9 10 11 12 13 14 15 16 17 18 Prosser, Joe; Grey, H.V. (1990). "Cave Diving Communications" (PDF). Branford, Florida: Cave Diving Section of the National Speleological Society, Inc. Retrieved 13 September 2016. 1 2 3 4 5 Staff. "Underwater Signals". UKDivers.net. Retrieved 13 September 2016. 1 2 Bevan, John, ed. (2005). "Section 6.4 Diver rope signals". The Professional Divers's Handbook (second ed.). 5 Nepean Close, Alverstoke, GOSPORT, Hampshire PO12 2BH: Submex Ltd. p. 253. ISBN 978-0950824260. ↑ Busuttili, Mike; Holbrook, Mike; Ridley, Gordon; Todd, Mike, eds. (1985). "Signalling". Sport Diving: The British Sub-Aqua Club Diving Manual. Stanley Paul & Co Ltd. pp. 64 – 65. ISBN 0 09 163831 3. ↑ Staff (2016-01-01). "Ops Component Standards" (PDF). ERDI Standards and Procedures. ERDI. Retrieved 13 September 2016. ↑ Staff. "Survey Equipment" (PDF). Standardised survey procedures for monitoring rocky & coral reef ecological communities. Reef Life Survey. Retrieved 13 September 2016. 1 2 Kieren, Lauren (2016). "Cave Diving: Directional and Non-directional Markers 101". tdisdi.com. SDI - TDI - ERDI. Retrieved 9 September 2016. ↑ Allyn, Richard (2011-11-04). "Submarine rescue drill off Point Loma". 760 Talk and breaking news. 760kfmb.com. Retrieved 9 September 2016. ↑ "U.S. Navy Signal Flags". United States Navy. 17 August 2009. Retrieved 31 August 2016. ↑ McMillan, Joseph (2001). "Maritime Warning Signals". Sea Flags. Retrieved 31 August 2016. 1 2 3 Staff (2004). "Rule 27". International Rules for Preventing Collision at Sea. Sailtrain.co.uk. Retrieved 31 August 2016. 1 2 Staff (2016). "Visual Surface Signaling Device Styles". Signaling devices. PADI. Retrieved 13 September 2016. ↑ Parsons, Chris; Darwent, Alice (August 2012). 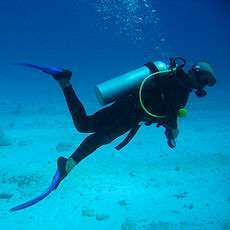 "Ask an Expert: Should Surface Markers Be Mandatory When Diving?". Training. Scuba Diving. Retrieved 13 September 2016. 1 2 3 4 Russell, Mark (2014). "Easy Diving - SMBs". Dive Magazine. Syon Publishing. Retrieved 13 September 2016. ↑ Liebscher, Caren; Pellegrini, Cristian (October 2015). "Enhancing underwater communication - The Buddy Watcher". Alert Diver. Divers Alert Network Europe. Retrieved 22 July 2016. 1 2 3 Staff (June 2014). "Method of communication between diver and surface". Divingherotage.com. Retrieved 5 September 2016. ↑ Staff. "John Player Cigarette Cards - Communications". Diving History. UKDivers.net. Retrieved 5 September 2016. ↑ Staff (2016). "The Anthony and Yvonne Pardoe Collection of Diving Helmets and Equipment" (PDF). Auction catalogue for 15th June 2016. Exeter: Bearnes Hampton & Littlewood. pp. 39, 54. Retrieved 5 September 2016. ↑ Staff. "About Ocean Reef GSM G Divers Communication System, Yellow". Leisure-pro. Retrieved 5 September 2016.